Hi everyone, Cheryl Corley, here. Still keeping the chair warm for Michel Martin. I typically work in Chicago. But while I'm here filling in for Michel, I decided over the weekend to become a tourist and went on a walking tour of the U Street area in Washington. 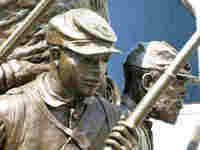 I came across a fascinating find -- the African-American Civil War Museum and the African-American Civil War Memorial, which will celebrate its 10th anniversary next month. At the memorial, there's a statue of colored troops surrounded by walls bearing the names of the more than 209,000 soldiers of African descent that served in the Civil War. The Assistant Director of the Museum, Hari Jones, told all of us on the tour so many rich nuggets of information. Tell Me More had to have him on the show, especially since Juneteenth was so near. Of course, Juneteenth is traditionally known as the day slaves in Texas found out about the Emancipation Proclamation. Jones says there's much more to the story, so take a listen. I'm sure you'll learn something you didn't know. Then, take a look at our audio slideshow. Tell Me More webmaster Lee Hill took some beautiful photos of the memorial and the museum. Of course, African-Americans have participated in every major U.S. war. The recent flap between film directors Spike Lee and Clint Eastwood over Eastwood's World War II films sparked some controversy, though, when Lee criticized Eastwood for not including blacks in his films Flags of Our Fathers and Letters from Iwo Jima. Lee is making his own film, Miracle at St. Anna, about an African-American military unit. But we decided to go straight to the source. Former Marine Sergeant Thomas McPhatter has his own riveting story to tell of his days in the military when he found himself heading toward the beach on Iwo Jima in February of 1945. War horrors often cause problems for veterans returning home. Our Wisdom Watch guest, Judge Robert Russell, told us about the court system he's set up to deal solely with veterans. All that on the show today. Plus, a feisty argument over an effort to stave off some of the ever rising foreclosures in the country.